The full-keyboard rotary calculator came about as a result of a meeting between Frank Baldwin (the pioneer of the pinwheel mechanism) and businessman Jay R Monroe in around 1911. Baldwin had developed a machine which combined the best features of the calculators of the time - the four-function arithmetic capabilities of the stepped-drum and pin-wheel machines, and the rapid keyboard setting of the key-driven Comptometer. Monroe recognised the possibilities, and established a company to bring the machine to market. The Monroe "High-Speed Adding Calculator" entered full-scale production in 1914. The concept was soon taken up by other manufacturers, and the technology developed rapidly. By the early 1930s the range covered everything from portable hand-cranked units to high-speed electric machines with multiple registers and fully-automatic multiplication and division. New features such as back-transfer, memory registers, and square root extraction were added during the 1940s and 50s. 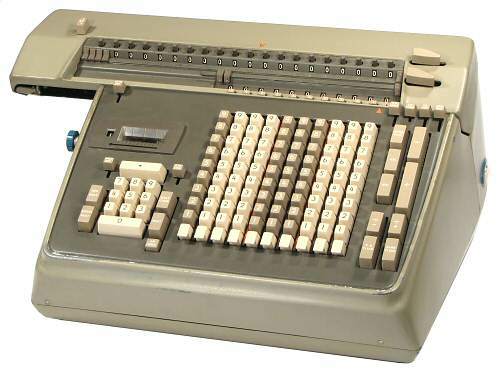 Although still slower than the Comptometer in adding long columns of figures, the full-keyboard rotary calculators excelled in any application that required more than just repeated addition. They found a ready home in business and commercial applications, and were the mainstay of scientific and engineering offices from the 1920s until the early 1970s. 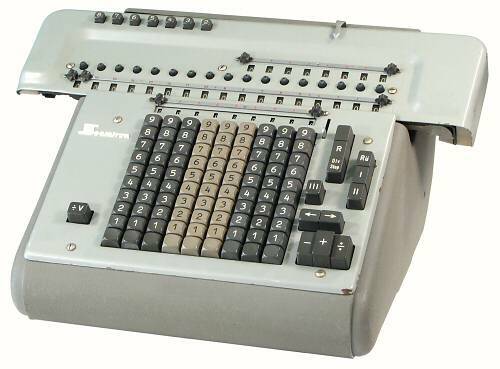 The fully-automatic calculators were extremely complicated machines, and were correspondingly expensive. The top model in the Swiss-made "Madas" range contained almost 4000 parts, and cost around $1100 in Australia in the mid 1960s - about one-quarter of my annual salary as a graduate engineer. 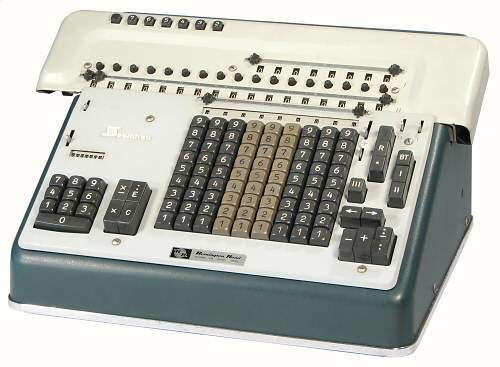 The development of these top-line mechanical calculators came to a sudden end in the early 1960s with the arrival of the first electronic machines. Manufacture and sales continued for a period, but by the end of the decade the electronic machines had become cheaper than their mechanical equivalents. (They were initially about five times the price). The mechanical calculator companies were merged, sold, and re-structured during this final period, but they had mostly disappeared by the early 1970s. The full-keyboard rotary machines most commonly found in Australia are the "big three" American brands (Monroe, Marchant, and Friden) and the Swiss-made MADAS. Follow the links to separate pages for these manufacturers, or continue on for some of the less common brands. Several Italian-made "Numeria" machines from the 1950s and 60s are described on the Lagomarsino page. Heinrich Diehl's foundry and press works was established in Nürnberg in 1902, but was not involved with calculating machines until the 1950s. The Diehl calculator was developed from the long-established "Archimedes" line, developed by Reinhold Pöthig in Glashütte from 1906. Glashütte became part of East Germany after the 1939-45 war, but Pöthig's son-in-law Ulrich Eichler and several of his staff joined Diehl in Nürnberg in a venture to re-establish the machine. A new range of full-keyboard machines was produced from 1952, followed by fully-automatic ten-key printing machines from 1963 until 1972. This Model EVM18S was built about 1958. It is a motor-driven stepped-drum machine in the style of the Archimedes, with automatic division and "on-the-fly" multiplication. The principle of the short-cut multiplier mechanism is described in Eichler's US Patent 2215263, filed in 1936. Technology: Stepped drum, automatic division. The German "Rheinmetall" heavy engineering works was established in Düsseldorf in 1889. A munitions factory in Soemmerda was acquired in 1901. After the 1914-18 war the Soemmerda factory turned to office machines, producing typewriters in 1920, a full-keyboard calculator in 1922, and a ten-key adding and listing machine in 1933. The calculator range continued to develop up until the 1939-45 war. Following the second war, the Soemmerda factory found itself in East Germany. 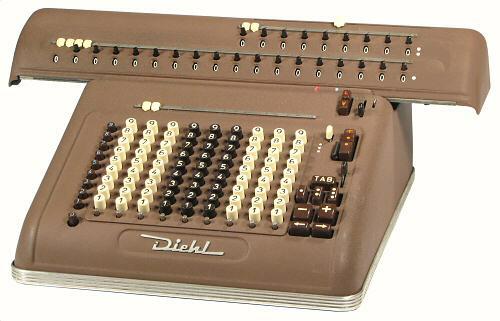 Calculator production and development continued as a state-run enterprise, using the pre-war Rheinmetall name and logo. A large part of the production was exported through an agency in Berlin. The name was changed to "Supermetall" in 1960 and to "Soemtron" (for "Soemmerda Electronics") in 1962. 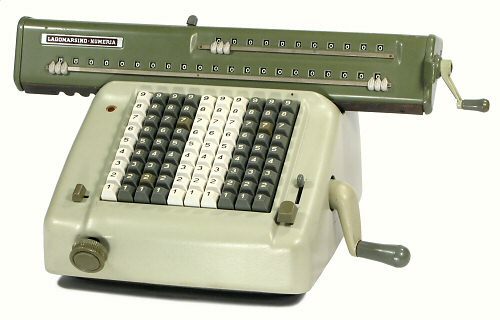 Production of mechanical calculators ended in 1967, but the firm continued with electronic office machines and computers until 1991. This Soemtron Model 209 from the early 1960s is the same as the Rheinmetall Model KEL IIc R. It is built on a substantial aluminium frame, with cast aluminium sides and sheet-metal front and rear panels. There is a check dial above the keyboard, full tens carry on the counter register, and carry to eleven places on the accumulator. There is a back-transfer mechanism from the accumulator to the setting register. The machine performs automatic division, with a one-touch setup key on the left of the keyboard. Technology: Stepped drum, full automatic. The Soemtron Model 215 is a variant of the Rheinmetall "Super-Automat" SAR IIc K, first produced in 1951. The machine illustrated was built in around 1965. The machine is basically the same as the Model 209 above, with the addition of an automatic multiplier mechanism on the left-hand side. The accumulator tens-carry has been extended across the full 17 places. and the four-part case has been replaced with a one-piece surround in cast aluminium. The Technical Section of this site has illustrated technical descriptions of the workings of the Monroe, Marchant (Figurematic) and the MADAS calculators. The current descendants of the Monroe company have a web site which provides information on their early history, including articles by Frank Baldwin and Jay R Monroe. Ernie Jorgensen's recollections of his years with Marchant are available on James Redin's web site. Frank Rauck's web site has an extensive history of Carl Friden and his company, together with lists of serial numbers and production dates. Ray Mackay's recollections of the MADAS calculators are also available on James Redin's web site. For those who read German, the Rechnerlexikon web site has a detailed history of the Rheinmetall and Diehl calculators. A general history of Rheinmetall and its military production is available in English on the company web site.